One of my 2017 stationery resolutions that didn’t materialise, was to draw. I had drawn a little but it was haphazard and my progress was slow simply because I wasn’t finding the time. This year I really want to change that and make drawing a habit. I have amassed a small collection of items that I enjoy using and plan on making these part of my art supply toolkit. I thought I would share these with you. 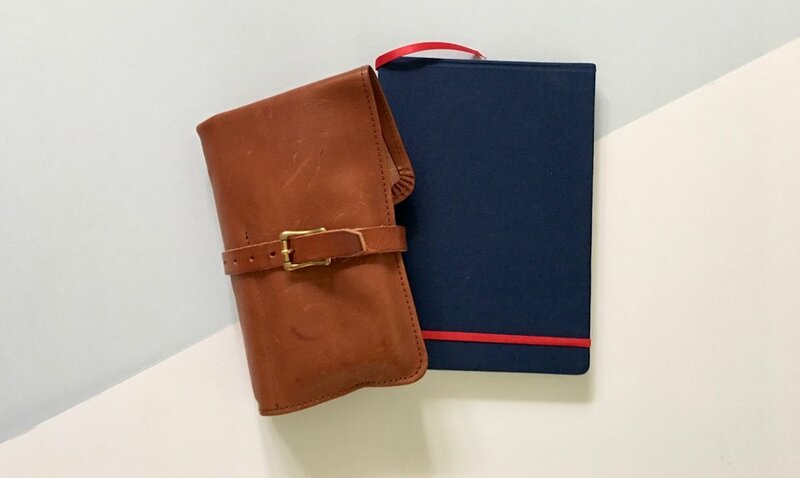 There are two or three sketchbooks I have tested and tried to get along with but there are some that I have found I enjoy and plan on making these my staples. 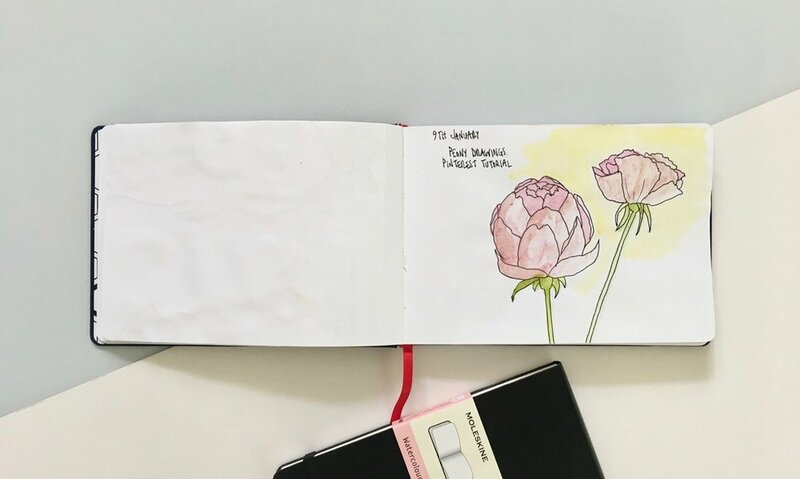 One is the Moleskine watercolour sketchbook. I have a pocket and an A5 size. I like how slim they are and the paper is quite nice. The second is the Mindstone sketchbook which was sent to me to test out. There is a lot to like about this sketchbook and I will review this product properly in an upcoming post. I really like the cloth cover and the elastic strap. The size is great too so this is a big winner for me. 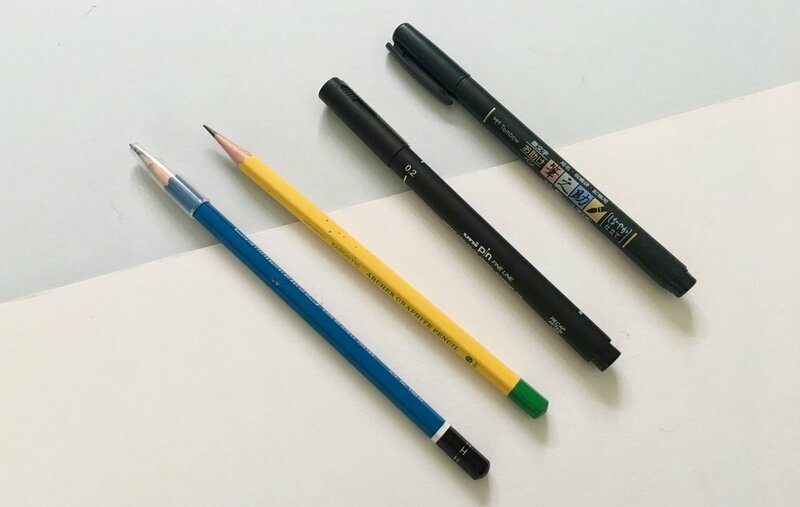 I have a few pencils that I have been using. I find it helpful to sketch a very light and rough outline first as I am awful with my proportions and therefore not confident about going straight in with ink. I have been using my Baron Fig School Set Archer pencil, my Staedtler Mars Lumograph and a Blackwing 602. They’re not the ideal sketching pencils and really I should be using a Blackwing MMX. It’s no surprise really that I have found my favourite sketching tool to be a fountain pen. It feels so nice to use and I like the wet ink on the page. I find it far more enjoyable than a drawing pen, but I do have a Uni-pin there for good measure. 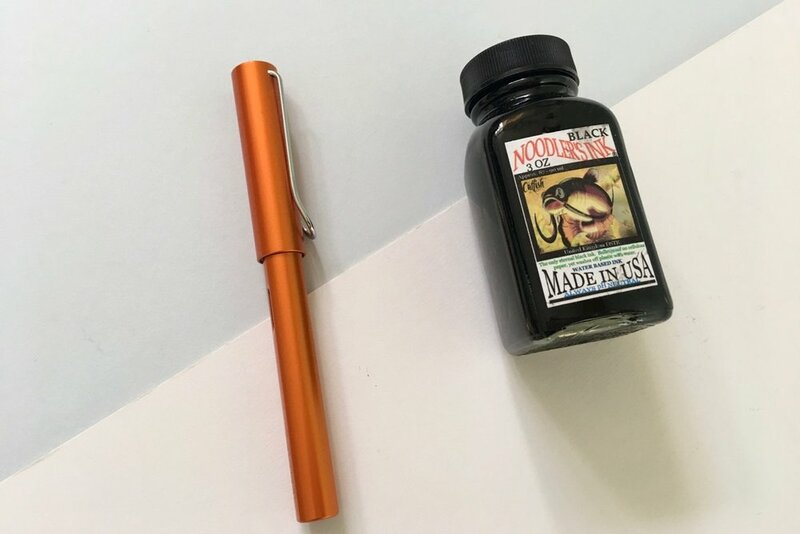 I am using my Lamy AL Star Copper Orange with a fine nib and Noodles Black for drawing. The pen is perfect and easy to carry around and the Noodlers Black ink is waterproof which means I have the option to add in watercolour. I have recently changed my palette. I was experimenting with a simple Winsor and Newton Cotman 12-pan palette that I bought cheaply to basically try out the colours and not over invest in something that I may not have really liked. However I really struggled with the quality of this palette and after watching some YouTube videos I decided to upgrade. I now have a few Winsor and Newton professional watercolour tubes and have created my own palette and now in a lovely metal tin. There are a lot of holes here and I know I am missing some basics (any suggestions welcome) but I am just piecing everything together and trying to find something that’ll work the best way for me. I invested in a Rosemary and Co. pocket brush some time ago based on a recommendation in a YouTube video, I forget which. I really love this brush because it’s a travel version. It takes up minimal room and I can protect the brush. I think I have the size 6 brush but again can’t be sure. 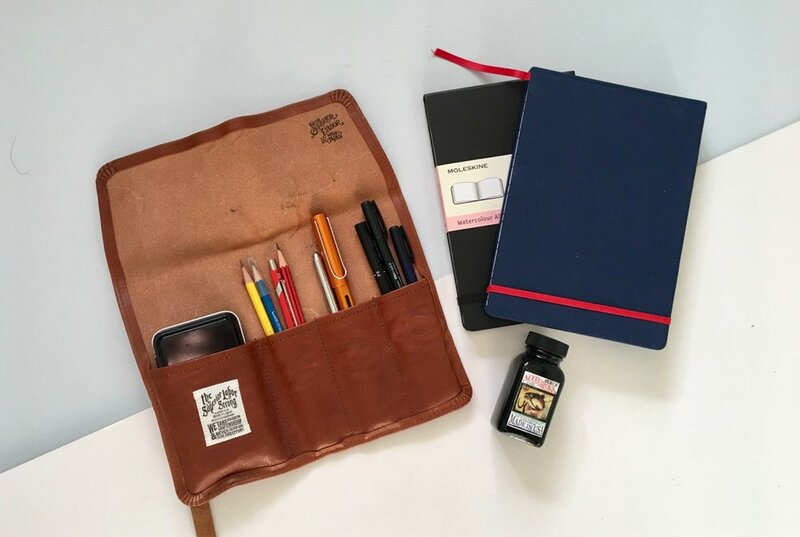 I have been keeping my sketching tools in my Superior Labor pen pouch which really wasn’t how I intended to use it but it works quite well. The large pocket holds my small palette really nicely and I can just throw all the pens and pencils and brushes everywhere else. This is the state of my sketching for the beginning of 2018 and I am sure there will be changes throughout the year. 2017 was almost a year of testing and trailing out different tools. I have refined my watercolour palette and found sketchbooks that I think work well for me. At the moment I like the simplicity of my current art toolkit, now I just need to use these tools more often.